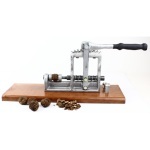 Master Cracker-Filbertnut Cracker (Hazel Nut) - Black Walnut Cracker for Serious Nut Crackers! This is the original American Made Master Cracker with high quality parts and workmanship. This filbertnit/ hazel nut cracker will last a life time, in fact many life times! The cracking cups are deep and oval providing snug seating for hazel nuts. This dramatically reduces chattering. The tension springs help lock the nut in place. This is a heavy nut cracker using green sand casting. This is obviously not Chinese made. The Master Cracker accents quality with a rubberized handle for long-use comfort. The Master Cracker totally destroys the outer shell of filbertnuts while minimizing shell shatter. There is hardly any need for nut picks or diagonal pliers. Very well built with good strong parts. The adjustability for size and pressure are excellent!!! I highly recommend this product!